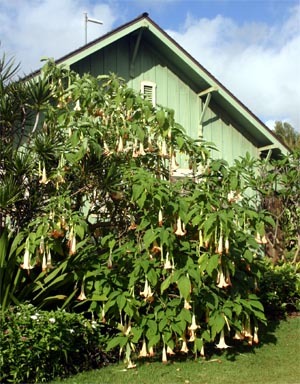 An angels trumpet at the National Botanical Garden in Kauai. 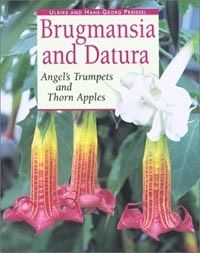 Brugmansia is an exotic, small tropical tree in the family Solanaceae, also commonly called angel’s trumpet, that produces dramatic, pendant, trumpet-shaped, fragrant flowers. They can get up to 30 feet tall when grown outdoors in tropical and subtropical climates (more often 15-20 feet), but adapt well to container culture, where the plants remain a much more manageable size (4-15 feet) through pruning and root restriction. Brugmansia is native to South America, particularly the Andes, where they grow on sloping terrain with warm, humid days and cool nights. It is a long-lived perennial in zone 9 and warmer. There are several species (which are not readily available except from specialty nurseries), many of which have been hybridized to create spectacular cultivars. There is great diversity among Brugmansia flowers, with individual blooms ranging in size from 4″ to 24″ long depending on the species/cultivar. They come in many shades of white, yellow, gold, orange, peach and pink. There are singles, doubles, triples, and quadruples and a few shredded forms, and variety of funnel and trumpet shapes. Some cultivars bloom throughout the growing season, others flower in flushes every 6-8 weeks, while some only produce flowers in cool weather. Some produce lots of flowers while others have few flowers. Flowering, flower color and flower form are all affected by light levels, pH levels, nutrition, stress, temperature and humidity, so flowering may vary even for the same cultivar depending on the location and conditions where it is grown. A pink-flowered Brugmansia growing in New Orleans. Fragrance varies considerably, too, with intensity ranging from none (B. sanguinea) to overpowering. The intoxicating scents are variously described as musk, lemon, mint, lily, hyacinth, citrus, jasmine, gardenia, and more. Regardless, the fragrance is most noticeable on warm summer evenings. At one time these plants were included in the genus Datura, but taxonomists have divided the two groups into different genera. Brugmansias are a long-lived, woody perennial, eventually reaching heights of over 20 feet in frost-free areas. 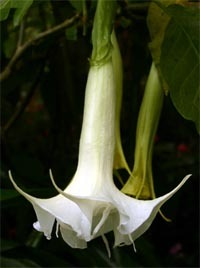 They have downward to slightly outward-facing, large (6″ to 24″ long) trumpet-shaped blooms, in shades of white, cream, yellow, peach, orange, pink, and red and rarely set seed. In contrast, Daturas are a short-lived herbaceous perennial (they rarely live more than 3-4 years even in frost-free areas), are usually grown as an annual, and rarely exceed heights over 6 feet. Their smaller (2″ to 8″ long) white, cream, yellow, lavender or purple flowers are held upright above the plants and set seed freely. A Brugmansia in full bloom at Balboa Park, San Diego. In the upper Midwest, in-ground or potted plants will do just fine in full sun; in hotter climates they need afternoon shade. Container-grown plants will enjoy being outside for the summer, but must be brought inside when temperatures begin to cool. 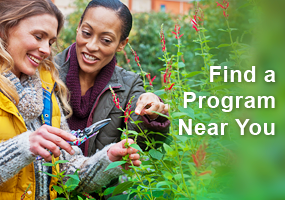 In the fall, move plants you wish to keep indoors before the first frost, checking carefully for insect hitchhikers (you may wish to spray the plants to minimize pest problems later). They can be treated as a houseplant in winter if kept in a greenhouse or other sunny spot; otherwise they will lose most of their leaves. They will continue to flower year-round if they get enough light and temperatures are above about 60˚F. Provide moderate amounts of fertilizer and as day length increases, more flowers will appear. 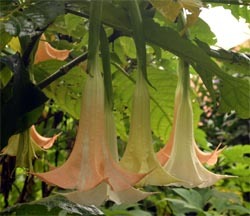 Peachy Brugmansia flowers in Costa Rica. Unless you have the proper location, it is easiest to overwinter Brugmansia by keeping the plant in a cool, poorly lit area (such as a basement) and allowing it to go dormant, watering only as often as necessary to keep the soil barely moist. Let the leaves fall off the stems and check every few weeks to make sure the soil doesn’t dry out too much. If the plants are already in containers it is not necessary to prune them except to fit into their indoor spaces. In the spring, once the danger of frost is gone, move them outside or plant in the ground for the season. Prune and shape at this time. If you had plants planted in the ground, in the fall they can be cut back to the soil level to create multiple cuttings or can be dug up and potted to overwinter. The cut-off plants can sometimes be stored over the winter in a cool, dark room where they might produce roots and can then be potted up when they begin producing leaves the next spring. 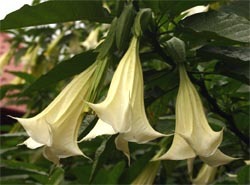 Brugmansia flowers are very fragrant. Wait until all chance of frost has passed before moving Brugmansias outside again, gradually increasing their exposure to sun and wind over a few days. 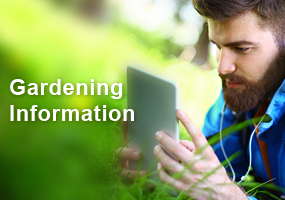 The plants can then be pruned – hard if necessary – to encourage bushy growth, shape the plant or limit size. Species can be grown from seed (hybrids cannot), but most people purchase specific cultivars grown from cuttings. This plant is easily propagated from stem cuttings rooted in water or in damp sand or perlite without rooting hormone (although this can be used). Use semi-ripe wood (stems that have begun to change color from green to brown) at least the diameter of a finger and 6-8″ long. Cuttings can be taken any time the plant is actively growing, and any part of the trunk or branches can be used. Strip off all leaves and buds except the topmost set of small leaves. Put the cuttings in 2-3″ of water in a brightly-lit, warm place, changing the water every day or two and keeping the level consistent. Alternatively, insert the cuttings a third of their length into the rooting medium, pressing the medium around the cutting, water thoroughly, let drain completely, cover if humidity is low (not necessary when humidity is high) and place in a bright, warm place. Pot up in medium sized pots when roots are several inches long, usually in several weeks. Water thoroughly, but wait until the soil becomes almost completely dry to water again until the plant is established (to prevent root rot). Brugmansias grow quickly, so will need to be transplanted to a larger container when the roots have filled the smaller pot. 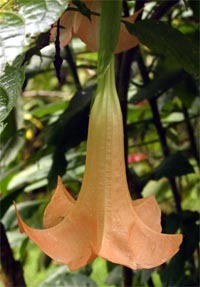 The flowers of most Brugmansia are pendant trumpets. Brugmansia is a very heavy feeder and should be fertilized regularly – maybe as often as twice a week during the growing season (the more food, the more flowers it will produce). It consumes amazing amounts of water, but it also requires good drainage and does not like to stand in water, so a large plant may require frequent watering. The leaves will droop when it needs watering, and quickly recovers when watered. I often have to water my plant 2-3 times daily on hot summer days. The plants will need much less water and fertilizer in the winter (little water and no fertilizer if allowed to go dormant). These plants are very attractive to several insect pests. 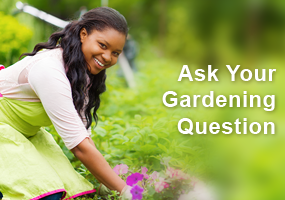 Aphids, mealybugs, whiteflies and especially spider mites will ravage the plants if left unchecked. All of these pests are easily controlled with insecticidal soap, but this needs to be applied regularly to the underside of the leaves (directly onto the pests) to keep populations under control. The plant will drop its leaves when heavily infested, but generally regenerates new leaves quickly (give the plant more fertilizer when this happens). If you are growing your plants year-round (not allowing them to go dormant), be aware that insect pest populations begin to increase as day length increases, so keep on the lookout for infestations on growing plants throughout the winter, but especially in March and April. 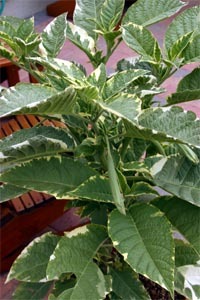 Some cultivars sport variegated foliage. B. arborea has the smallest flowers, which are nodding rather than pendant. Brugmansia ‘Charles Grimaldi’ is an old favorite that produces profuse, intensly fragrant blooms of a luminous golden color changing to orange-salmon with maturity. 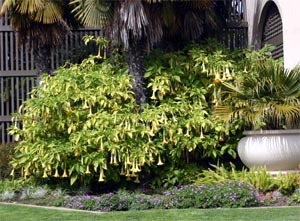 Brugmansia ‘Cypress Gardens’ is one of the best for containers. Young plants often flower at 3 feet in height with dozens of trumpets opening at once. The white flowers fade to a light salmon with age. It is most fragrant at night. Brugmansia ‘Ecuador Pink’ is a popular variety with one of the deepest pink flowers. It produces flushes of long, pink trumpets with fluted edges every month under optimal conditions. Brugmansia ‘Inca Sun’ is a new hybrid that flowers continuously from the spurs and shoots and on very small plants (under two feet). Typical cultivars flower, then stop, grow and flower again, but the flowering mechanism for this hybrid is different so it continues to flower and grow simultaneously. The moderately sized flowers open in tones of light yellowish peach. It grows to 4-6’ in a container. Brugmansia ‘Jamaican Yellow” has very fragrant, lemon yellow flowers. 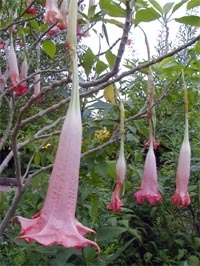 Brugmansia sanguinea is the only species that has true red flowers, but it is not fragrant. Brugmansia versicolor has beautiful pale apricot flowers. This species from Ecuador has the largest flowers. Brugmansia x candida ‘Shredded White’ has double white flowers, but the petals are twisted, and divided, with curly tendrils, making the flower look distinctively different. Thought to be a hybrid between B. aurea and B. versicolor. Brugmansia x insignis ‘Pink’ is supposedly one of the easiest to bring into flower. The widely flared, 8-10″ flowers are a pale pink at the top and graduate to a deep, salmon-pink at the trumpets’ flare. This cross between B. suaveolens and a hybrid of B. suaveolens and B. versicolor is a prolific bloomer. Variegated foliage occurs in several varieties including ‘Miner’s Claim’ (cream-margined salmon-pink flowers), ‘Peaches and Cream’ (cream flowers), and ‘Sunset’ (pale yellow to light peach flowers). I have a yellow Brugmansia in bloom now. It has 6 petals as opposed to 5. Is this normal?